Last week we looked at creative and imaginative play and this week we’re still in a creative frame of mind but looking more specifically at arts and crafts. You don’t necessarily need to be super arty yourself; it’s more about getting stuck in and providing a creative outlet. We warn you though, if you like a pristine kitchen, this may not be for you! (We advise lots of paper down and pinnies!). Now just tell me if this doesn’t take you back to your own childhood – good old fashioned potato printing! This doesn’t have to be the splodgy mess you remember, you can make some amazing patterns and pictures using potato printing and it doesn’t have to be difficult. Get the kids to draw their shapes on a cut potato and you cut them out. You can also use shaped cookie cutters to make it really easy. You can make recurring patterns and great pictures from the most basic of shapes. As well as creating art on paper why not try printing onto fabrics with fabric paint? Plain white T shirts are really cheap to buy from supermarkets or discount shops so why not get them making customised T shirts for the summer?! There are lots of tips and tutorials on our Pinterest page. You can get some great results from this and it’s really easy to do. It’s also a good way to use all those bits of broken crayons you always seem to have lying around! 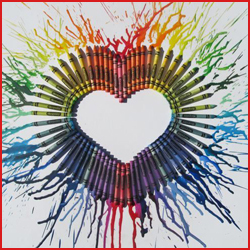 Crayons melt really easily so you can use them for art pieces or mix them up and melt them into new shapes. To make new shapes simply gather up all the little stubs of crayons, remove any paper still attached (I’ll be honest with you, this is the most fiddly part) and put them into silicon bun moulds. Mix up the colours randomly or stick to a few that complement each other. Put them in the oven for a few minutes and they melt together and, when turned out, create rainbow patterns in their given shapes. You can then use them as multi coloured crayons or decorate artwork, cards or gifts with them. Equally, you can make really great pictures. Stick full crayons onto paper or card (you can buy packs really cheaply) – you don’t need to necessarily remove the paper with this one – and use a hair dryer to melt the crayons. You can direct the flow whichever way you want to to make patterns. You can even melt them into jars to make candles or decorative pieces. Kids love this and you’re also teaching them a bit of science too (changing form and the effects of heat and cold). Why not collect up all your old bits of kitchen junk and use them to make multi-media building projects? Old kitchen implements like wooden spoons, cutlery, baking trays, plastic boxes and cups etc can be combined with junk items like boxes and packaging from food, foil, cling film etc to make art projects. You can also make wooden spoon characters and then encourage them to act out a story with them when they’re done. Use dry rice, pasta and pulses to make shakers or pictures. Kids will love the making and then the playing with the items when they’re finished. Win a £25 toy voucher! Don’t forget, if you try any of these or have ideas for other creative play activities you can do at home then comment on here or join in the conversation on our Facebook page. We’re entering everyone who joins in on Facebook to a prize draw to win a £25 Toys R Us voucher so get stuck in! 1 Response to "The Summer Kitchen Activity Guide Part 4: Arts & Crafts"
It is always so sad to see suemmr break coming to an end but shopping for new school clothes and supplies is always a fun way to usher in the new school year! My girls are getting so excited about starting Grade 1. Mummy, however, is a little sad to see her little girls growing up so fast!